The contribution volunteers make at Slide Ranch truly helps us deliver our mission. Whether you're a student fulfilling community service hours, a corporate and community group looking for team-building, or someone who wants to put your green thumb to good use, Slide Ranch provides challenging, engaging and meaningful experiences. Slide Ranch welcomes the participation of all volunteers, aged 14 and older. All minors need a waiver signed by their parents or legal guardians. We have set times and days for individuals to volunteer, and groups are scheduled on a case by case basis. Volunteers may also schedule a one-time visit or volunteer on a regular basis as part of an ongoing project. We would like to invite you to our annual spring celebration, SPRING FLING, on Saturday, April 27, 2019. Spring Fling is our biggest family farm event and fundraiser of the year. This year we are celebrating spring with activities including sheep shearing, goat kid bottle feeding, indigo natural dye, garden cooking activities, live music, and delicious farm-fresh food for sale. This year’s Spring Fling will highlight collective awareness and action for environmental sustainability and climate change. We are now recruiting volunteers to help make this fundraiser a success. Volunteers (16+) can work for either a whole or half-day shift and gain free entrance to the event as well as refreshments and meal tickets. Please register using the link below to reserve your spot. Volunteers are also invited to a special potluck dinner and Yurt dance party following the event and are invited to camp out! We welcome volunteers ages 16+ for half-day or full-day shifts, and to celebrate with an optional potluck dinner and camp out after the event. Join us in a volunteer fest celebrating Earth Day weekend at Slide Ranch on Saturday, April 20, 10am-2pm. 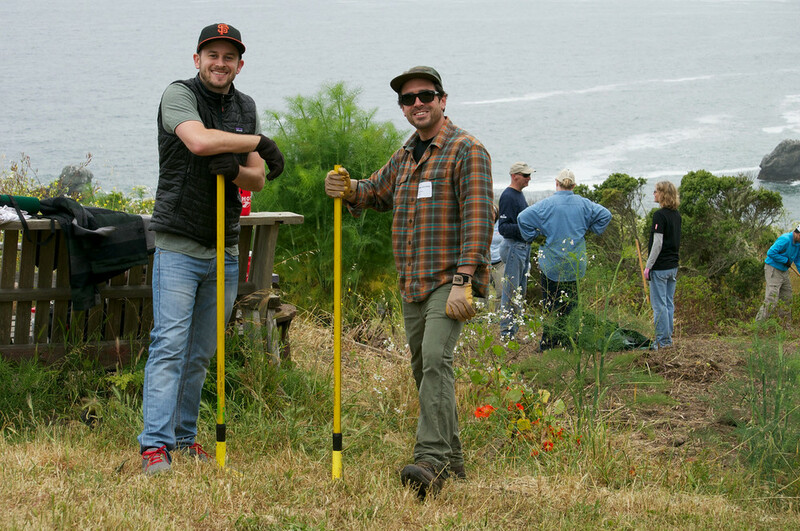 Lend a hand in a range of stewardship projects: farm work, including goat milking, coastal clean-up, invasive plant removal, and activities to help prepare for Spring Fling, our biggest fundraiser of the year on 4/27. Wear sturdy shoes and bring a water bottle and picnic lunch. Thank you for being an Earth Day volunteer and supporting Slide Ranch! We have garden volunteer days once a month in the Spring on the following Saturdays from 9am - 1pm: March 30, April 20 (Earth Day, registration link above), and May 4. Our weekly Saturday Volunteers days will resume during the summer, starting Saturday June 01. Please wear layered clothing that you don't mind getting dirty, and closed toed shoes. Volunteer Days are held RAIN OR SHINE, so dress accordingly! Remember to bring a water bottle to stay hydrated. Feel free to bring snacks or a lunch for a picnic afterwards. Gardening - weeding, pruning, prepping garden beds, planting and pest control, composting, restoring native plants and removing invasive plants, and maintaining trails and beach access, etc. Farm & Facilities - fixing fences, mucking out animal barns, building repairs, painting, etc. Office work - technology support, mailings, fundraising calls, social media, photography, filing, research, etc. Events - help with set-up and take-down, check-in, food service, clean-up, parking, etc. Please call the Slide Ranch office at 415.381.6155 or email admin@slideranch.org for more information and scheduling. Want to bring your office for a day of team-building? Please click here. Do you have a group who would like to do some volunteer team-building with an optional chef-prepared lunch and a wine reception? Please contact shelley@slideranch.org or see this info sheet. Want to see how volunteering helps Slide Ranch? 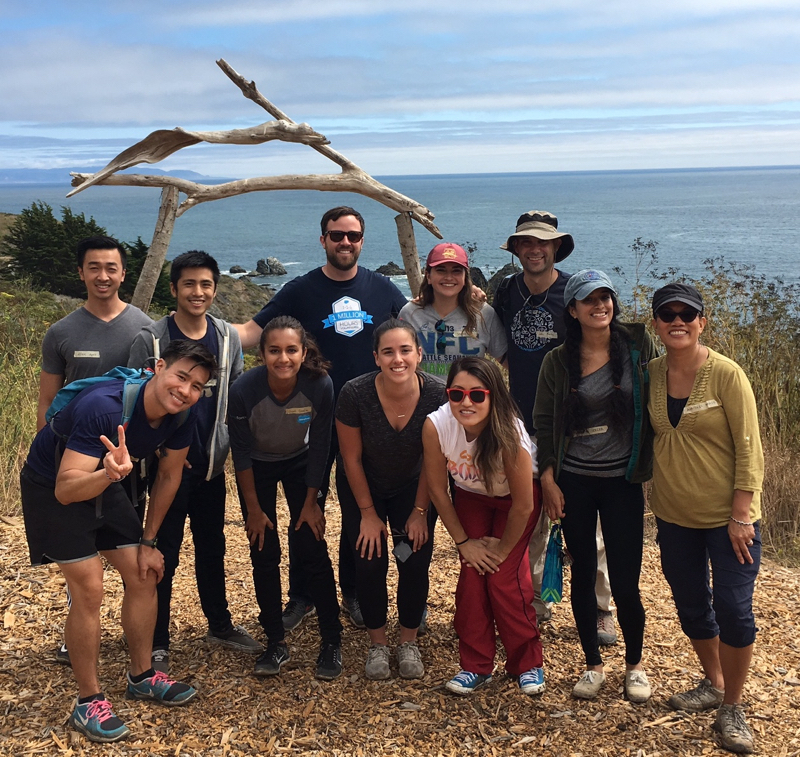 Check out the Clif Bar Volunteer Day here. Thanks for your interest in supporting Slide Ranch!